Mix the cream cheese and sugar in a bowl. Beat with electric beater until well blended. Add in the eggs and vanilla. Pour the mixture into the pie crust making sure to level the mixture after you are done pouring it. Bake for 45-50 minutes until just set. When you check the cheesecake, gently jiggle the pan. If the cheesecake moves too much like it’s still gooey, you need to bake it longer. Remove the cake and allow it to sit on a wire rack until completely cool. Cover and refrigerate overnight. 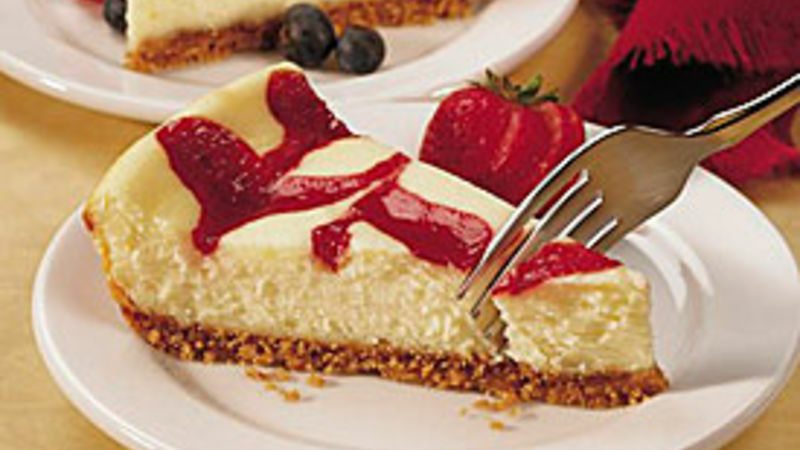 Before serving, spread enough of the strawberry pie filling to lightly cover the cheesecake. Extra pie filling can be used for those who like a little more topping. Now that you know the basics, it's extremely easy to mix things up and make a completely different tasting cake by altering a few ingredients. Once you have the strawberry-cheesecake basics down, creating different flavor profiles is simple. Modifying the crust is also an easy way to transform this dessert. Don’t hold back. Your favorite pretzels, cookies, cereal and nuts are all fair game for a crust that is just as decadent as the filling.